Looking for the best carpenter bee traps in 2019? Out of the carpenter bee traps we reviewed, we really liked the CBS Carpenter Bee Trap. Because it is easy to use, holds tons of bees, and has extremely sturdy construction. On top of that they hold a patent for the unique design made to capture the bees. The trap resembles a bird house and traps bees by making it difficult for them to escape. It can be hung anywhere outside and does not require bait. Although no bait required, we do recommend it for the quickest results. Thankfully, they makes a decent lure like this one. We also like Mac's Log Style Carpenter Bee Trap because it is pleasing to look at and more accurately mimics the carpenter bee's natural habitat. Please remember that no bee trap will be 100% effective but are still an important part of pest management. Also remember that the wood the trap is made of doesn't really matter so long as it attracts the bees inside. If you're interested in learning more about carpenter bee traps, proper setup, or just want to read more about the other products we considered, see below! Want to skip all this research and just hire a decent exterminator for your carpenter bee problem? What Are Carpenter Bee Traps? How Do Carpenter Bee Traps Work? What Are the Risks of Carpenter Bee Traps? Why Do Carpenter Bees Need Their Own Traps? What Bait Goes in a Carpenter Bee Trap? Where to Place a Carpenter Bee Trap? Do Carpenter Bee Traps Work? These traps are specifically tailored to carpenter bees, who are less likely to investigate a traditional sugar trap you might use for other bugs (like for wasp traps). Most traps look like birdhouses with a small opening at a slanted angle. They're designed to trick carpenter bees into thinking this is a suitable place to nest. When the carpenter bee enters and looks around. When trying to leave, they notice a hole at the bottom and enter, only to be stuck in a glass or plastic bottle. This bottle can be filled with liquid bait so the bee drowns. Otherwise, the bee becomes dehydrated or dies from the heat. A carpenter bee trap works by plugging up their current nest with caulk or some kind of stopper. This will trigger the bees to relocate and look for a new nearby nest. The next nest they find will be your trap fixing your carpenter bee problem. There are baits and lures on the market designed to speed up the process of catching carpenter bees. For example filling the container hummingbird feed works well or using a chemical lure like this (our recommendation). Most traps are reusable as well and can empty the deceased bees as needed. Stinging is the only real risk of using traps like these. If you're allergic or just want to avoid any and all contact from the bee a bee suit might be appropriate. Carpenter bees are not as attracted to sugary waters and baits as other species. They don't eat wood but are constantly on the search for new homes, which makes the wooden structure of this type of trap ideal. Simply put, you can't just stick a trap made for wasps up and hope it snags your bee problem too. Every insect has different habits and requires a slightly different approach. Most carpenter bee traps do not need bait, but it is still an option and may make your trapping mission a bit more effective and/or speed up the results. Like most bee traps, a sweet bait is ideal. This can be a basic mixture of sugar and water, soda, beer, jam, or even some plant oils like mint with water. People who want something poisonous can mix laundry soap with water. Some brands also offer dedicated lures that are meant to attract as many bees as possible. Ideally, you should apply a dusting with a product like Delta Dust, wait a couple of days to ensure the nest has been properly poisoned and spread, then plug up the old nest with either caulk or some kind of plugger (like this) and place traps directly above the defunct nest for maximum carpenter ant killing results. Now this IS important to take note of, because getting your placement wrong will screw up any attempt at solving your problem. 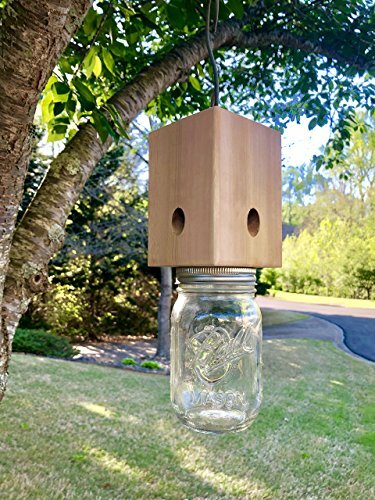 Carpenter bee traps can also work well when placed near the corners of roofs or the peaks of various items around your yard in sunny warm areas. This means they can be placed near picnic tables, porches, benches, and even along the sides of houses with wooden siding. Just do not place the traps in dark or cool areas or areas without proper over head protection from rain. Carpenter bee traps are highly effective and can drastically reduce the number of bees in a given area. It's important to remember that nothing will be 100% effective though and that some bees might remain. A trap should be used in conjunction with other methods (like dusting as described in the previous section) to ensure the best possible results. Again, no infestations are alike and all require a slight adjustment to the approach. Keep reading to check out which products we liked the most. 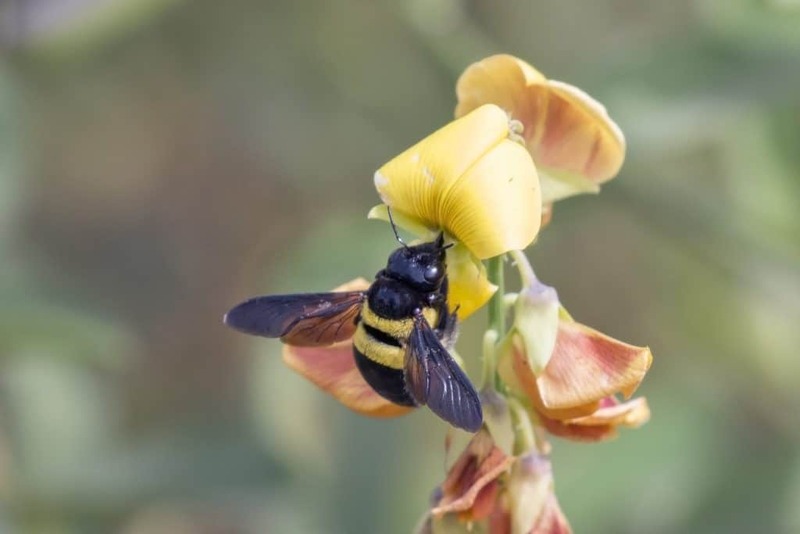 The CBS Best Carpenter Bee Trap mimics the natural habitat of carpenter bees and comes with a wire hanger so it can be placed anywhere in a yard. The trap is made from durable materials to last through most tough weather conditions. It contains no toxic ingredients and was deemed honey bee safe, so it is unlikely to hurt beneficial insects. The trap can be baited or left alone. It is easy to set up and requires little effort on the user's part. I recommend this trap to people who want something simple to catch bees. 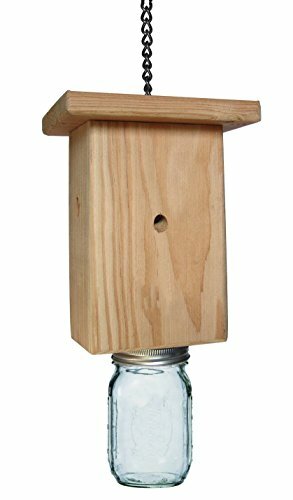 Mac's LLC Best Carpenter Bee Trap resembles a simple birdhouse with an attached glass jar. It comes with a wire so the trap can be hung anywhere carpenter bees might lurk. The construction is durable and it's difficult for carpenter bees to escape. It can handle different types of weather and was made to last for multiple seasons and years. It traps multiple types of bees and can be baited or not. I recommend this trap to people dealing with multiple bee infestations because of its construction and overall value. 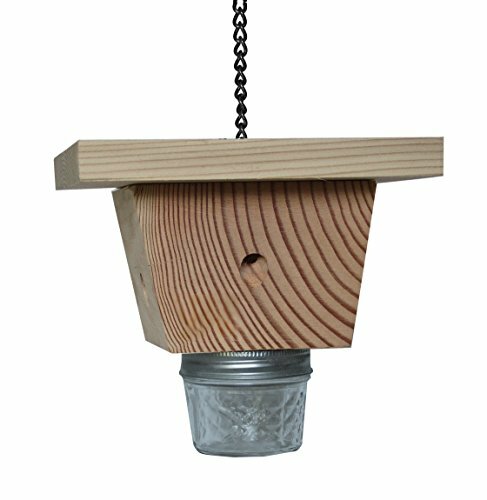 One of the neat features of Mac's Log Style Carpenter Bee Trap is that it resembles the natural habitat of the carpenter bee, making it extra attractive. The trap consists of a wooden log with a jar at the bottom for trapping bees. Mac's Log Style Trap is aesthetically pleasing and comes with a wire hanger so the product can be placed anywhere around a yard. It is simple to install and lasts for multiple seasons. It can even trap multiple types of bees. I recommend this trap to individuals who want something effective but also interesting to look at. Bees can be difficult to trap because they love flowers or, in the carpenter bee's case, old or rotting wood. This means a trap needs to compete with the wonderful environment of your yard. Curious about other bee related articles? Check out our other detailed guides to help you deal with your pest problems.